Don’t wait until an emergency arises in the middle of your trip to find out you can’t reach us! 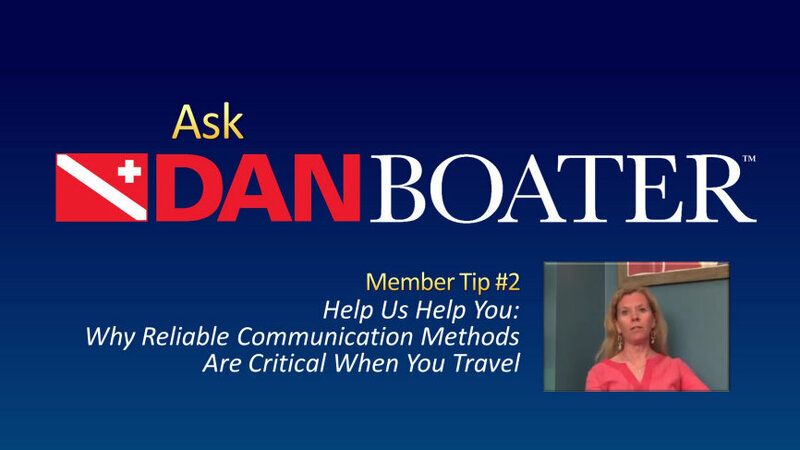 DB: We're here with veteran emergency hotline medic Lana Sorrel for a quick tip on the importance of having a reliable means of communication any time you travel, and not just when you're on the boat. Why is this so important, Lana? Lana: Thanks for having me. Great question! At DAN we've been doing evacuations and emergency travel assistance for over 35 years. But the problem is, so many travelers don't think about having to have a reliable means of communication. We're so tied to our cell phones now that it seems like we can get in touch with anyone anytime and, unfortunately, that's not the case everywhere. If we can provide assistance, we want to be able to do that but, we can't do that unless you have a way to get in touch with us. That could be with a cell phone. It could be with email. If your telephone has text capabilities. Satellite phones are very important. However, I did want to mention if you have a satellite phone and you are sailing, satellite phones we found not to be a hundred percent reliable, so I would certainly recommend doing your market research and find out if there is some other, if there's something that's available as a back-up plan. Just think about what would happen if your Sat phone went out and you had absolutely no way to get in touch with anyone. But our telephone number is always available 24/7/365. We're here to help you but we can't render help unless you can get in touch with us first. Join thousands of members who rely on DAN Boater's Medical Information Line for non-emergency medical assistance before, during and after traveling.